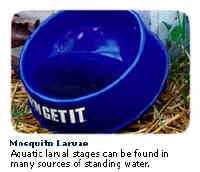 Mosquitoes lay their eggs in standing water, which includes puddles, stagnant ditches, and containers such as old tires, buckets, cans, neglected swimming pools, etc. Storm sewers, culverts, and catch-basins, etc. provide an outdoor resting place for adult Culex pipiens mosquito (the common house mosquito) which is most commonly associated with West Nile virus. This mosquito often enters homes through unscreened windows or doors, or broken screens. Turn over plastic wading pools, and wheelbarrows, etc. when not in use. Clean ditches of obstructions so they drain properly. Check trees for cavities that hold water and fill them with soil, gravel, or sand.